Well . . . once upon a time . . . three years ago, we were out on our evening meadow walk with our friend Joan. 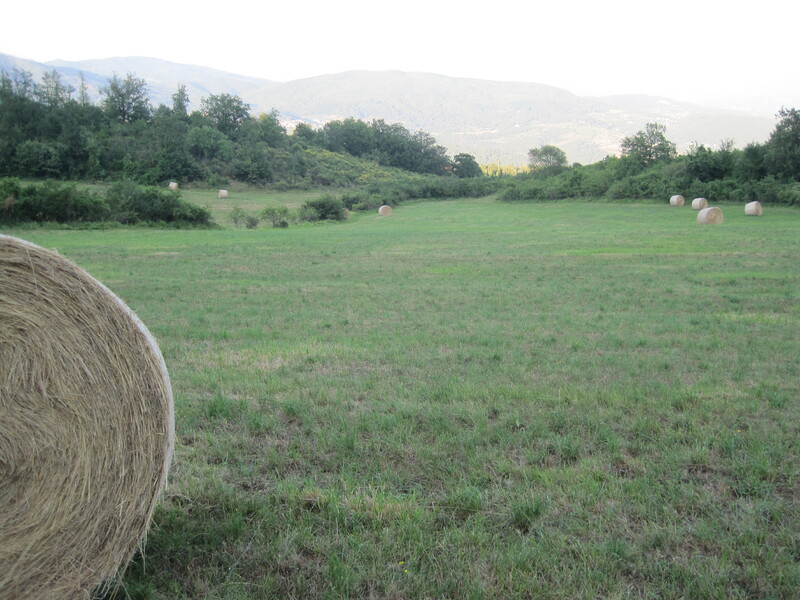 It happened to be the end of June, and Stefano, our local farmer friend had just cut and baled the grass in the fields. Well . . . Joan is an artist, and as you might expect, was captivated by the beauty of the sculptural round forms dotting the landscape. We all talked about them as we walked, playfully winding our way in and out of the geometric grass cylinders, marveling at the beauty of nature. About that time, one of us (probably Joan) said it would be a real hoot if we could roll one down the hill. We all laughed, wondering what would actually happen—would it fly apart from the centrifugal force; maybe crash into a tree and bushes, destroying the landscape . . . or, would it just be good old-fashioned fun? Sort of a sport-like thing akin to cow-tipping. It’s the kind of activity you would look forward to if you lived on a farm and were bored out of your ever-lovin’ mind. We weren’t bored, we just felt a bit mischievous! People often think that mischief is for kids. We’re here to tell you, that just isn’t true. In fact, mischief is the kind of thing that actually gets better with age. You can’t get into trouble anymore. What’s someone going to do . 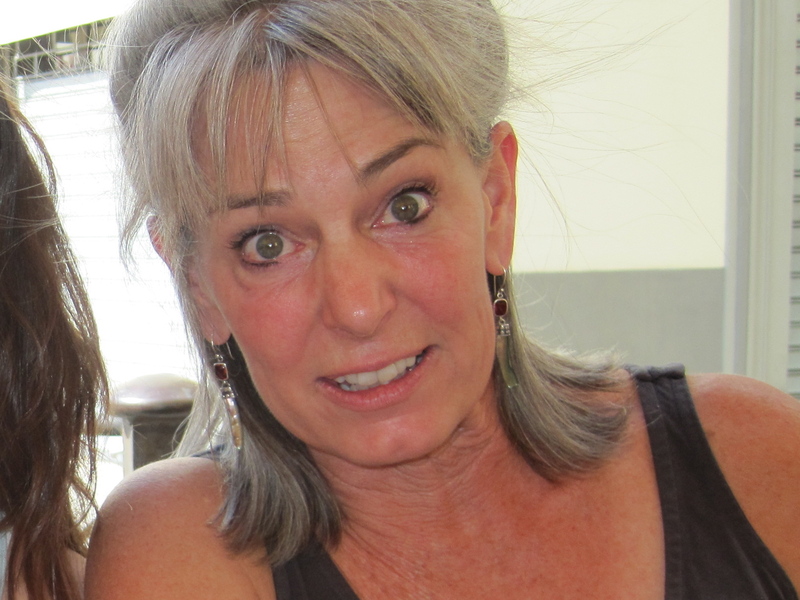 . . yell at a 60-year-old and tell them they can’t leave their room for 3 days? No! 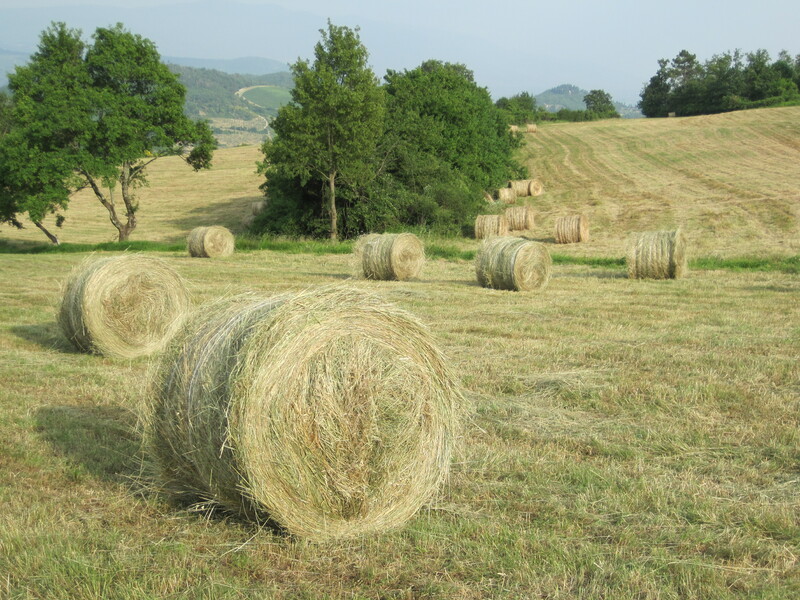 What’s the farmer going to say (in a whiney country voice) “You messed-up my perfectly round bale of grass—you meanies!” So, it’s a pretty safe time of life, not to mention great fun. The next thing we knew, all hands were on one of those bales trying to foist it into position for the maiden voyage. It wasn’t easy, but we did it, and off she went. We giggled like little kids as we watched that cylinder of compressed grass spin its way down the hill, picking up speed with each revolution. In less than a minute, it was lodged in the underbrush at the far edge of the meadow. We reveled in what just happened, intoxicated with a sense of freedom and power. Howling with delight, we walked on our merry way, recounting every detail of that first successful roll. The second year Joan wasn’t visiting, but we decided to launch another bale down the hill in her honor. That one actually took off like a rocket into the woods and disappeared. We were totally surprised. That line of trajectory completely caught us off guard. We were wide-eyed, but nevertheless, we had another immature moment of mischievous laughter. 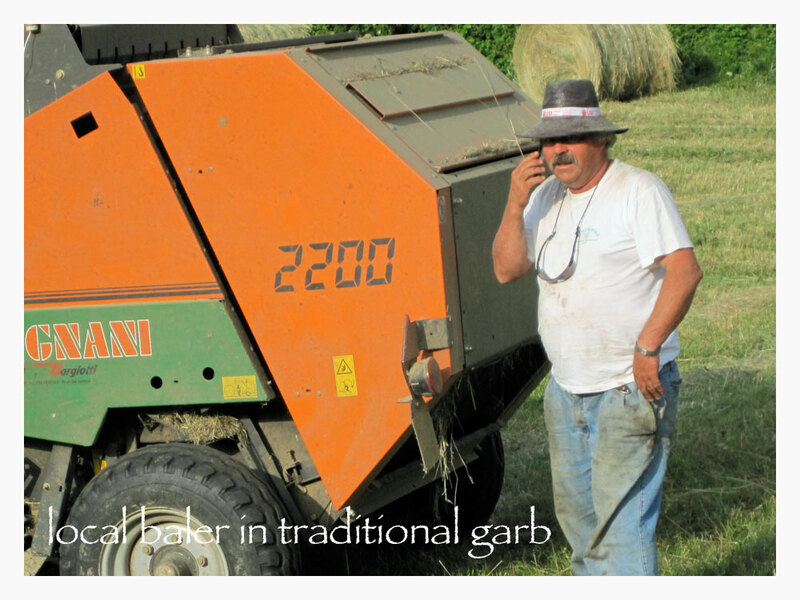 This year, we had decided that we were going to make the “bale rolling” into an annual ritual of silly mischief. (Here you might remember John Cleese’s famous Ministry of Silly Walks comedy sketch.) So, we took the cameras and the tripod to document the momentous event while we were at it. That’s when our playtime turned into even more than just an annual “ceremony.” Cheryl came up with the outrageous thought of aiming at another bale to see if we could hit one. 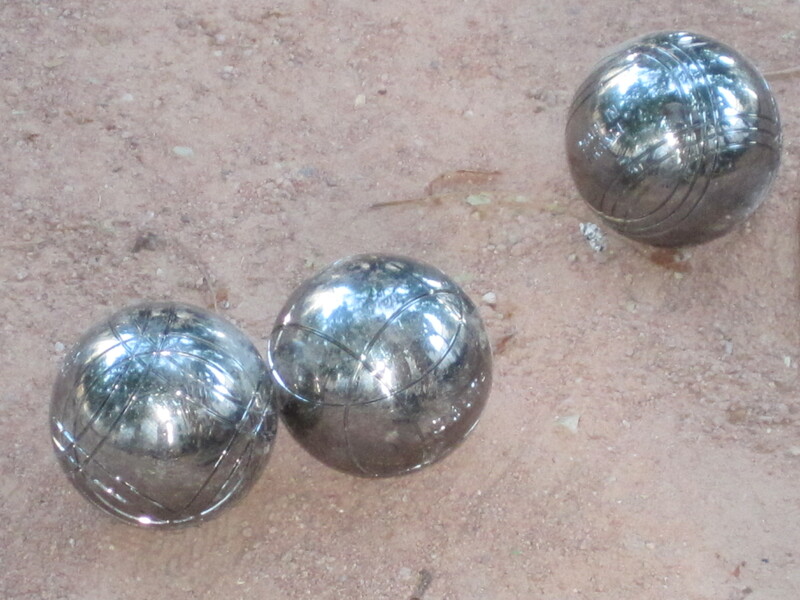 That’s when the idea of Bocce Bale was conceived. Emerson’s roll missed the target. But Cheryl’s expert aim and determination sent that wobbling bale directly into another, which was our first mid-field collision. Instantly, we both realized that we had unwittingly just invented a new international game that would soon become famous the world over. And since we were in Italy, the only possible name was clearly Bocce Bale. The rest of the story you can read in the history books! Following is our video of that first unofficial, unauthorized competition, where Cheryl’s game-changing shot altered the course of field-sports forever. Enjoy!